A layout with princesses, fairies and bling! A very girly page for me. The title phrase, frames and swirls were cut using Cricut cartridge 'Storybook'. I added glitter to the title and pearls around the page. I individually glued tiny beads around each photo frame (it took a very long time!). The paper range is from Kaisercraft. So here's my layout for Cooking with Cricut - Bling it on! 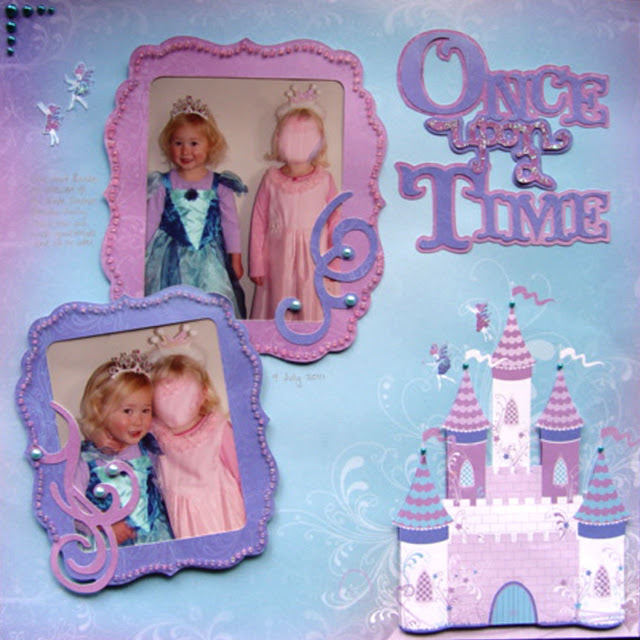 How adorable is this page with those darling girls in their princess costumes! Super cute! Thanks for joining our Bling it up challenge at Cooking with Cricut!! Your hard work was well worth it!! This looks fabulous! Love all the little beads:) This layout ROCKS!! TFS and thanks for joining us this week at Cooking With Cricut. Wow I can't image how long it took to put on all those beads...looks fabulous though! That background paper is so pretty too, absolutely perfect! Oh my, this is just too adorable. The bling is just so perfect for this girly layout. Thanks for sharing at CWC. Oh my! Love this! I can't believe you glued all those beads -- amazing! Great LO, Karen! Thanks so much for linking up this week with at Cooking With Cricut!